Hado is a word used in Japan to express a specific “life-force energy”, a “wave motion” or “vibration”. 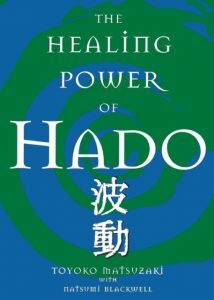 “Hado is everywhere” By sharing her life story, experiences, and self-help tips Madam Matsuzaki allows the reader to connect to the hado within and around everything. The expectation is healthier and happier living for all of us. Another example of how energy healing is becoming more popular around the globe. A short (125 pg) and educational read.